Lionfish (Pterois volitans) is an invasive and predatory species whose proliferation over the Caribbean Sea threatens to cause great damage to coral reefs by negatively affecting the balance of the ecosystem. Control strategies have been the most effective way to reduce the negative impact of the lionfish. The development of diversified food products based on lionfish could support these strategies. The objective of the present study was to investigate the influence of ultrasound and the addition of binders in different concentrations: Egg white liquid (EWL) and corn starch (ST) on texture, microstructure and sensory evaluation properties of patties made of lionfish surimi. Each set of binders was added up to 3% varying proportions. The texture profile, water holding capacity, sensory qualities and fractal dimension of scanning electron microscopy images were analyzed to evaluate the quality of the product based on surimi gel. 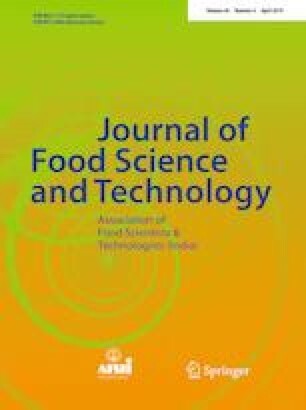 Results showed that the application of ultrasound and the use of binders enhanced the properties of patties made of lionfish surimi. The addition of EWL (3%) improved the water holding capacity and hardness of the final product. However, the fractal dimension of the images was higher in samples processed using ultrasound and without binder addition. The online version of this article ( https://doi.org/10.1007/s13197-019-03698-6) contains supplementary material, which is available to authorized users. Authors would like to thank the University of La Sabana and COLCIENCIAS for funding the development of research within the framework of Project EICEA-98-2015., Project 761-2016 of COLCIENCIAS.